In their quest to spread their seeds, plants have proved endlessly adaptable. Some, such as dandelions, produce spores that can fly miles on a puff of wind. 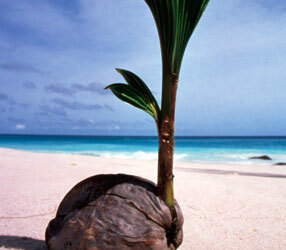 Others, like coconuts, have engineered seeds that can survive thousand-mile voyages at sea. Some of the most remarkable seeds, however, are those adapted to survive fires so intense they kill virtually everything else in their path. Many of the world’s pine forests, for instance, grow in arid climates, where a single flash of lightning can spark an inferno. Trees that couldn’t take the heat died out long ago. Those that remain generate seeds that are fire-hardened better than any high-security safe, able to protect their precious genetic cargo from the heat. Some seeds, however, recall the mythical Phoenix, a bird that would rise from a fire’s ashes to begin life anew. To thrive, these seeds actually need to get burned: intense heat is required to explode their seed cones or crack their hard kernels, so that water can leak in and begin the growth process. Such “fire-germinated” species are common everywhere forest fires occur on a regular basis. In an ironic turn of events, the recent campaign to stamp out forest fires has put some of these species in jeopardy. Indeed, in some parks, rangers now intentionally set forest fires just to make sure certain plants grow. Many prairie species, for instance, only sprout after fires clear the way. That has made the spring “prairie burn” an annual ritual throughout much of the Midwest, with teams of fire-wielding plant-lovers tromping into the fields in a quest to imitate the grass fires that once swept across the plains. In Michigan, biologists have also become fervent arsonists in an effort to make sure there are enough young jack pines, a kind of tree essential to the survival of an endangered songbird called the Kirtland’s warbler. For some reason, the bird will nest only in the young pines — and the trees will grow only in recently burned forests. That’s because fire is needed to get the pines’ tough cones to crack open and release their cargo of seeds. Recently, however, biologists have learned that flames aren’t enough to unlock some fire-resistant seeds — they need the smoke as well. In the 1970s, researchers discovered that some seeds germinate when exposed to the merest whiff of wood smoke, even if the seed is buried in the soil. The response makes sense: the seeds can wait years underground until smoke reveals that a fire has taken place overhead, filling the soil with fertilizing ash and clearing away plants that might block the seedling’s light. Having gotten its smoke signal, the young plant can take advantage of the disaster. But smoke is made of literally thousands of chemicals, and researchers have long puzzled over which ones might be triggering the seeds. Then, in 1997, researchers Jon Keeley and C. J. Fothereringham of Occidental College in California were able to pin down one of the responsible agents: a gas called nitrogen dioxide. They discovered that the seeds of a common wildflower called yellow whispering bells germinated when exposed to even tiny amounts of the gas. The discovery, however, had a troubling side. Nitrogen dioxide is produced by natural fires — but it is also one of the most common pollutants produced by cars and power plants. Tons of the compound fall to Earth every day, carried by rain and dust particles. Some botanists fear the pollution could be tricking sleeping whispering bells seeds into thinking a fire has occurred — causing them to sprout beneath the deadly shade of another plant. That would mean fewer seeds would be around when a fire really occurs. Like other plants, however, even whispering bells show creative variation in getting their seeds to sprout. While those that live in fire-prone areas need smoke to germinate, whispering bells living in deserts, where fires are scarce, don’t respond to smoke at all. Instead, they have evolved a clever response to the desert’s scouring winds. For these seeds to germinate, they must be blown across rough sand, which scratches the seed’s outer coat. Moisture then leaks in through the scratches, signaling the seed that it is time to grow.